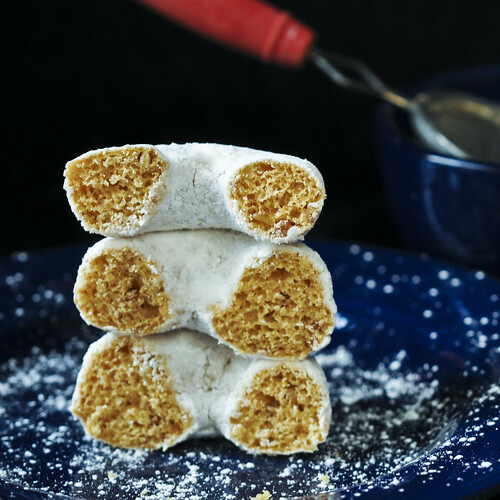 Love Powdered Sugar Donuts but don’t love the “junk food factor?” Make Baked Powdered Sugar Donuts for yourself, and ease the guilt a little. The recipe also incorporates white whole wheat flour to make you feel even more virtuous. I used to buy them out of a vending machine–packages of 6 mini powdered sugar donuts with so much sweet powder they could induce a coughing attack just by biting into them. Like sucking a sugar cloud into your lungs. I decided to recreate those favorite donuts of my youth with a healthier profile. I’ve done it before, i.e. 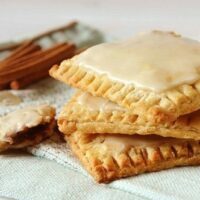 these Homemade Brown Sugar-Cinnamon Oatmeal Pop-tarts. 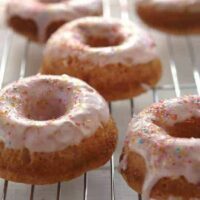 What would happen if I baked the donuts instead of frying, substituted white whole wheat flour for all-purpose white flour, and added some yogurt for extra protein? After a few false starts, I found powdered sugar heaven for around 100 calories a donut. Now I’m not claiming you can’t tell the difference from their fattier relatives, but they more than satisfy my cravings. Mix them up easy as muffins, and bake in less than 10 minutes with no greasy mess or odor in your house. Thanks to Lara Ferroni who got me started down the baked donut path with her Baked Chocolate Doughnuts. She taught me two important secrets about homemade donuts. Add nutmeg to get the characteristic flavor of a donut. I didn’t know and likely would have left it out since it’s not my favorite spice. The idea of using a zippered plastic bag (although she used a decorator bag), with a hole to fill the pans, also came from her. Absolutely inspired! 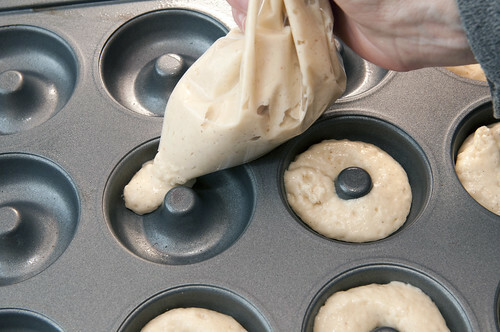 Use a zippered plastic bag with the corner snipped off to pipe dough into donut pan. But what if you don’t have a donut pan? Make donut “holes” with a mini muffin pan. I bought my doughnut pan at World Market, but they are available at most kitchen stores and online in the 9-15$ range. White whole wheat has all the nutritional value of regular whole wheat without the characteristic bitter flavor. I have not tried regular whole wheat in this recipe. Pecans pack a lot of flavor into these little gems. Chop finely and the kids won’t notice, or leave them out if you wish. Regular yogurt can be substituted for Greek yogurt. Reduce the milk to 1/4 cup. Use a plastic bag to coat donuts without a big mess. 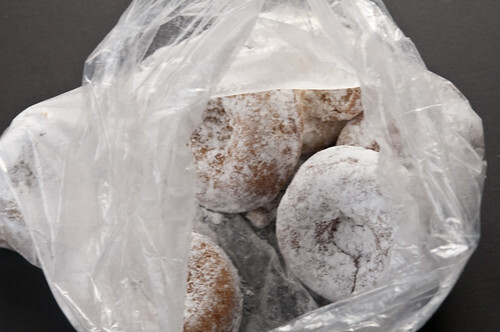 Coat donuts by tossing in a plastic bag with sugar and shaking. Grease doughnut pan well (I use spray oil with flour in it i.e. Baking by Pam). Whisk flour, sugar, baking powder, baking soda, salt, nutmeg and pecans (if using) together in a medium mixing bowl. Spoon batter into pastry bag or quart-size zippered plastic bag. Seal. Snip small corner of plastic bag and force dough out of hole in a fat rope that encircles each doughnut cup. Fill only 1/2 to 3/4 full or you will lose the hole in the middle of your doughnut. Makes 12 donuts and possibly 3-4 "donut holes" in a mini cupcake pan. 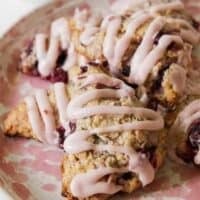 Easy-to-assemble scones you can bake straight out of the freezer. These donuts are lite and fluffy, not too sweet, just right and so easy to make. I used bread flour, sour cream instead of yogurt and added 1/2 teaspoon of cinnamon. If you are using a regular size donut pan it makes 8 donuts. This morning my husband ate 3 before they were cool so I can’t make them very often. I just stumbled onto your blog, and it was love at first “site”! I just bought a Bella doughnut whole baker for $8.49…. just wondering if you think this recipe would rise enough to fill in the “hole”. Still not sure what “salad in a jar” is, but I can’t wait to find out. Thank you!! I have made these twice now, and both times I had a hard time getting the powdered sugar to stick to the donuts! Suggestions? 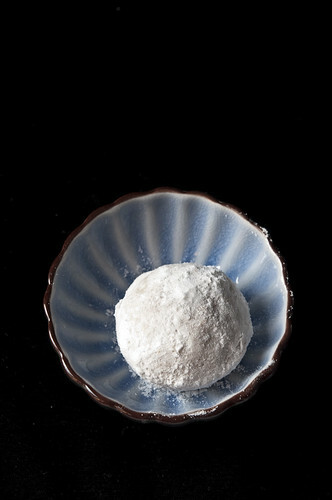 Powdered sugar has a tendency to “melt” away. I usually powder once out of the oven and then again just before serving. I’ve had these pinned for forever. Maybe one day I’ll make them. I shared them your my blog! http://blog.shopdirtylaundry.com/posts/2013/2/26/123-too-cute-tuesday.html >> ENJOY. hi! might be a silly question but how do you get the powdered sugar to stick? and is there anything added to the coating other than the powdered sugar? i dont think i saw any instructions on that part? Thanks! Paula- how are these made a day before serving? Do I keep them in the refrigerator? Hmmm. Afraid I don’t have a good answer since I have never made them the day before. 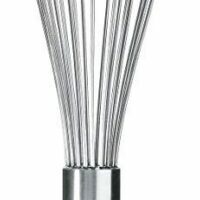 The batter is similar to a muffin. Best right after you bake them but certainly edible the next day. Let me know how they turn out if you try it. Oldest boy has requested that I make the next batch in muffin cups, so I can fill them (I’ll use pudding), and he can have a better version of an eclair! You are brilliant! Eclairs in a muffin pan? Why not! My daughter devoured the donuts,yay ! I made a new batch of them tonight ,along with with the poptarts ( not completed just the dough in the freezer for now ) another dish. Last night I made the broccoli,rice and cheese casserole, which is just delicious ! My little one doesn’t like melted cheese, but her Mom sure does 🙂 I’m thrilled that I’m not being bombarded by the extra sodium you find in the canned soups too. Thank you so very much for putting all of your hard work and ingenuity up here. I really appreciate all of it 🙂 Im such a beginner too, especially with baking, that all of your hints and notes you include are incredibly helpful ! I can imagine how much your daughter loves these donuts. They can be hard to resist. She will love the pop tarts too, although they are quite a bit more trouble but a great project to make with your kids. Hope you enjoy your salad in a jar. I did not have good luck with adding salad greens to my romaine but maybe yours will be better. They just didn’t last nearly as long. I wrote about it here. Have a great day! I love snooping through your recipe archives! 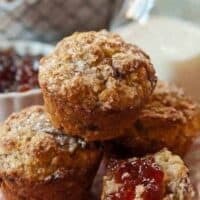 I made these yesterday because my parents were visiting me for a cup of tea and we loved them – the pinch of nutmeg is wonderful. Tasha, I like the way you think in regards to the doughnut holes. And feel free to snoop anytime. If I don’t have any Greek yogurt what can I use? More milk? And how much more? Buttermilk would be a good substitute or sour milk (1 cup of milk with 1 tablespoon vinegar or lemon juice added to it), but use a little less because Greek yogurt is quite a bit thicker. You may have to experiment a bit. Wow!!!!! 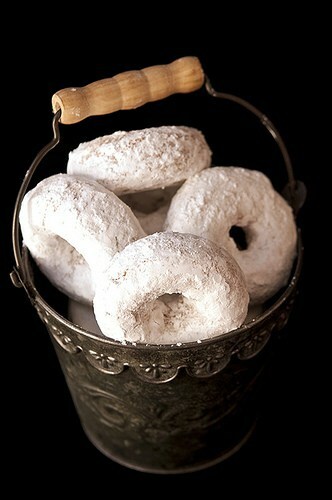 !, those donuts in the pail look beautiful, can’t wait to make them. They look to-die for. YUM!!!!!!!!! Found your site looking for a homemade powered donut recipe. Just made them with a donut maker and they turned out GREAT! My son can’t eat store bought powdered donuts because of the egg in them. So I used an egg replacement and they turned out great! o-o-o-o Meg, I have not tried spelt. Next time I go to Whole Foods, I will pick some up and try it. Does that mean the donuts would be gluten-free? Spelt has gluten in it, so they wouldn’t be Gluten-free. They would be wheat free. 🙂 I’m wheat intolerant but okay with gluten, so I use spelt flour a lot and came to your blog after a google search for donut recipes with spelt. Yumm this looks so good. I’ts on my list of things to try. First so sorry about your dad – second I have a question and don’t know where to ask it. I found a recipe for spiced maple banana muffins on tasty kitchen. Can you sub whole wheat flour for the regular flour? If so one to one? I’m not a baker and don’t know the science behind all purpose and ww – so I thought I would ask the scientist!! Rebecca, that make take a bit of experimentation. If you are using regular whole wheat flour, I would try half whole wheat and 1/2 regular to begin with. Play with it from there. If your are using WHITE whole wheat, you could possibly get away with more whole wheat than white but can’t predict result for sure. Whole wheat flour will definitely change the texture. I’m not really the authority on whole wheat but some of my readers are. Can anybody help? Who doesn’t love a donut once in awhile and a healthy one…well that just means I can eat more and if these were sitting in front of me I surely would. Bookmarking this recipe! Thanks for posting. wow–those look amazing! (i know exactly what you are talking about with the “powdered sugar cloud”) i really should try baked donuts, as cake-style donuts are my favorite anyway. I remember my dad making donuts years ago in an electric donut maker (like a waffle maker but for donuts) and we loved them as kids–they were a Saturday morning treat! 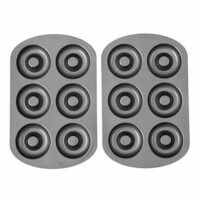 I got a donut pan several years ago and even though it was supposed to come with recipes it didn’t. It has been sitting in the cupboard ever since with the hope that some day I can use it and make the donuts like my dad did. I am SO glad to have found this recipe and know you liked it. My kids BEG me for donuts all the time (but I rarely concede) so I am totally going to be trying these out soon. Thanks! You are brilliant! I don’t eat fried food (hardly ever), but these look perfect. My kids would love them, too! Must make. These look sensational. I’m bookmarking this now. Thanks! OOhhhh my! I love this recipe! What about sprinkling them with a cinnamon sugar mixture? Options are endless! Thanks Paula! Love it. Another recipe that uses my new donut pan! I like the food gawker feature. These look great! I can just picture that precious little one enjoying these. My favorite donut is a glazed cake donut. Starbucks has a good one and so does Krispy Kreme. Thank you Paula for the great recipes! These were delicious! And yes, Kent loved them & gobbled it right up. Definitely a winner for kids! Hooray for baked donuts! I must try these! Also, nutmeg? Who knew? I always loved Powdered Sugar Donuts as a kid. I’m looking forward to making these very soon! Fantastic post, Paula. I have been way into the fried dough of late, so to see these “baked” is wonderful. They look delicious! oh those look great and I love the whole wheat factor too, I need one of those donut pan for sure. Thanks for sharing a great recipe. This looks like a post from heaven! Perfect white powdered donuts just calling out my name! Beautiful photos too! I really appreciate your pointers with your recipes too! As a little girl I lived for these and Fig Newtons. Who would’ve thought I’d grow up to be a dietitian?! Ha. I still do enjoy my treats, and these would bring back some many memories. I entered your contest, but I wonder if I could make these free-form. Do you think the shape would hold if I simply piped the ring on a baking sheet? I wonder. Heather, that is a BRILLIANT idea. I suspect it might work although they might not be real pretty. Certainly worth a try. I used to love Fig Newtons too but it has been a long time since I had one of those. yum! these look great. I cant wait to try making some! I grew up in New England, of course I LOVE doughnuts. My favorite are the old fashioned or cake doughnut. I didn’t know New England was famous for their doughnuts. What a cool place to grow up. Ooh, I love your photo of the stacked donuts! Very creative composition. I haven’t had a powdered sugar donut in over a decade, and these look delicious! Oh wow, Jenny! I consider that a supreme compliment from you with the very creative photographic eye yourself. Thanks. Powdered sugar donuts are my absolute favorite. I’m heading over to your FB to sign up for that pan!